Have you ever thought a cup of tea would greatly improve your theater going experience? Well now there is one show where you can indulge in this idea. 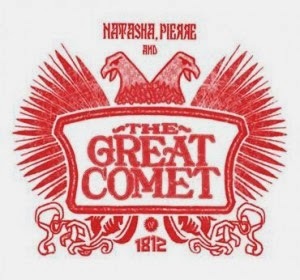 I'd been meaning to see Natasha, Pierre, and the Great Comet of 1812 during its popular run in the meatpacking district but never had the opportunity. I was excited to find out the show and its Russian supper club Kazino have found a new home in a lavish tent in Times Square with an exciting new addition- a Russian style tea service! The show is an interactive 'electro pop-opera' based on the novel War and Peace where you sit in a supper club and dine during the performance. It's also supposed to be quite scandalous. Intrigued yet? Imagine sipping tea brewed with a samovar while interacting with the performers. The a la carte Russian tea menu is offered during matinee performances, with sweet and savory options such as scones and sandwiches along with four choices of tea. I have been invited to attend the show in a couple of weeks, and can't wait to share more about it! It's perfect for any tea-obsessed theater lover like myself. Stay tuned! I viewed several Samovar when I visited The Russian Icon Museum (http://museumofrussianicons.org/en/) in Clinton, MA; they are huge and lovely. I have yet to have tea from them. The museum does have tea servings on Saturdays but I have yet to attend. Enjoy and happy teas!